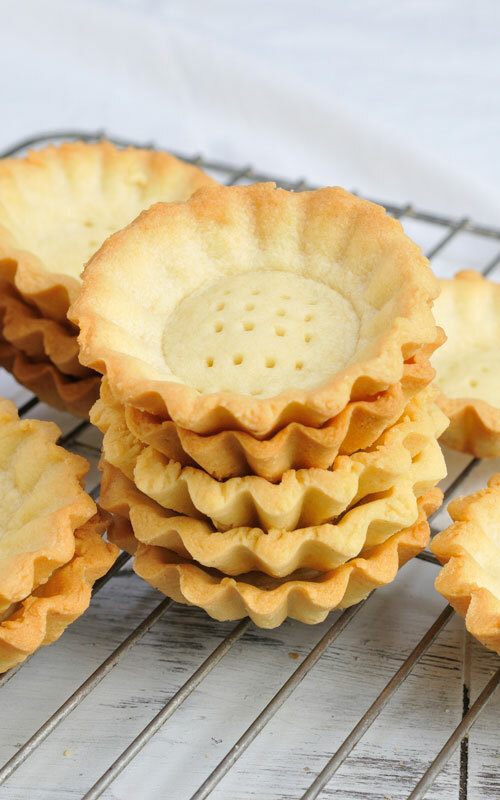 Today I’m going show how I make homemade Mini Tart Shells. I honestly love working with this cookie dough. 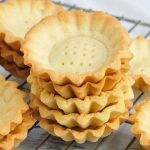 Not only I use it to make my homemade mini tart shells but I also use it as a base for my my Linzer Cookies. And it is also a perfect recipe for cute Rose icebox cookies or stamping technique. I use unsalted butter at room temperature, powdered sugar, egg yolks and lot so vanilla extract and all purpose flour. Most tart shell recipes use cold butter I don’t. I start by creaming butter and powdered sugar. Then in a small dish I whisk together egg yolks and vanilla. Gradually beat it into the butter. Sift flour and salt and gradually, with the mixer set to low speed mix in the flour. Scrape down the bowl and dump the dough onto a work surface. 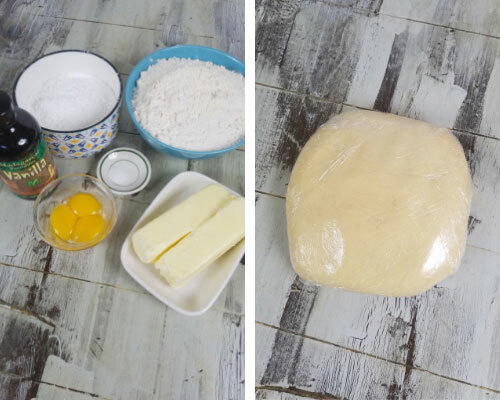 Gather dough into a ball. Flatten it into a disk. Wrap the disk into a plastic wrap and chill for 1 to 2 hours. 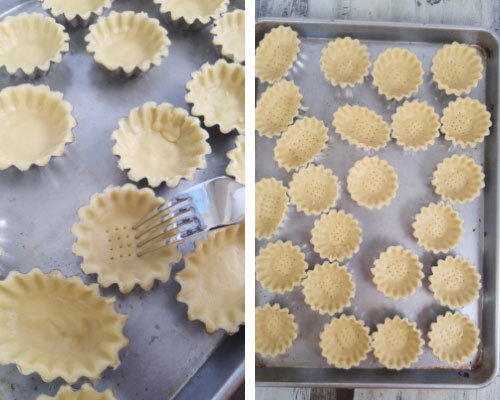 I use small metal tart shell molds. 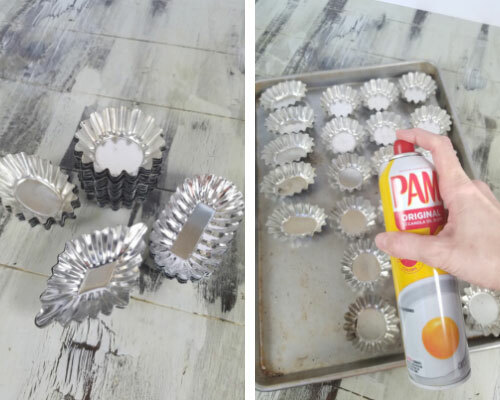 Place them on a baking sheet and spray the molds with a nonstick spray. Set aside. Start by rolling out slightly softened dough to about 1/8 inch thick. My molds are about 2.8-3 inch inch across at the widest opening. I used 3 inch cutter to cut out cookie rounds and an oval shape cutter to cut out oval shapes. Press each round into the metal mold. 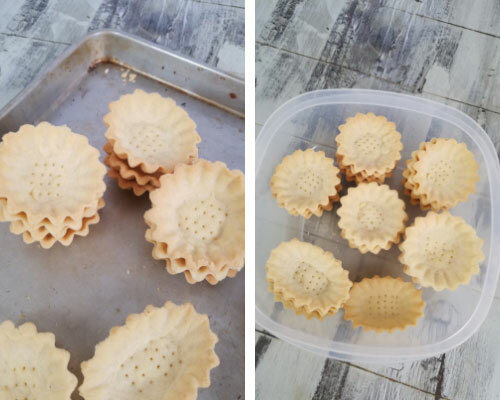 First shape it with your fingers and then using a spare tart mold, gently shape the inside. I like to put a piece of food safe plastic wrap over the bottom mold first. Then gently press in the spare tart mold, aligning the fluted edge with the bottom tart mold edge. Clean up the edges. It is important to prick the unbaked shell so it doesn’t puff up in the oven. I use 4 prong fork. Bake the shells in the preheated oven at 350F for 12-14 minutes, until edges are lightly golden brown. 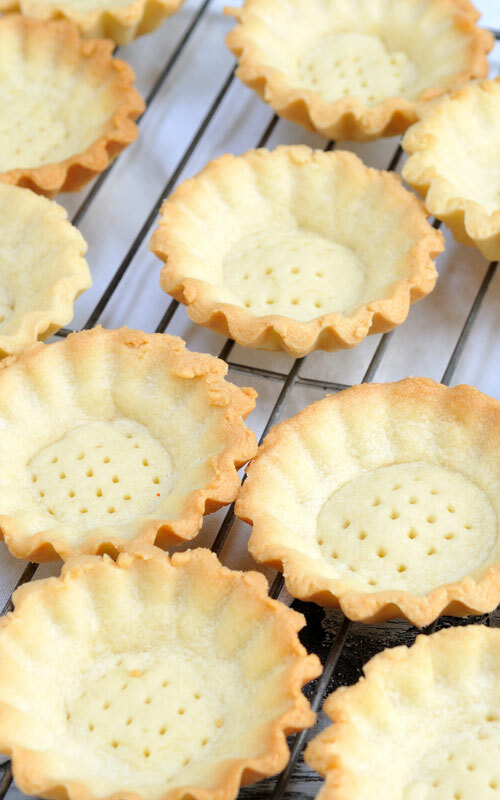 Let the baked tart shells cool for 10-15 minutes or little longer before removing them from the molds. 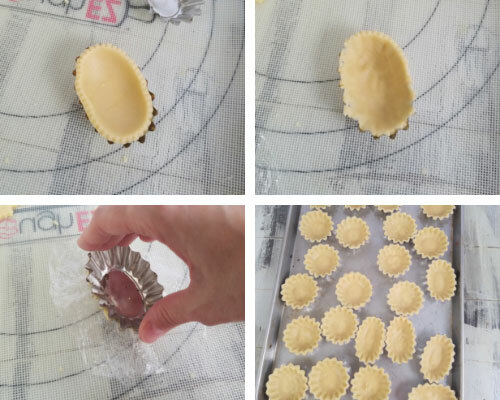 Tap the edge of the mold on your work surface to release the mini tart shell. Baked shells can be stored in the fridge for up to a week. You can also freeze them for up to 3 months. Makes about 20-22 mini shells. In the mixer fitted with a petal attachment beat butter and sugar until smooth. 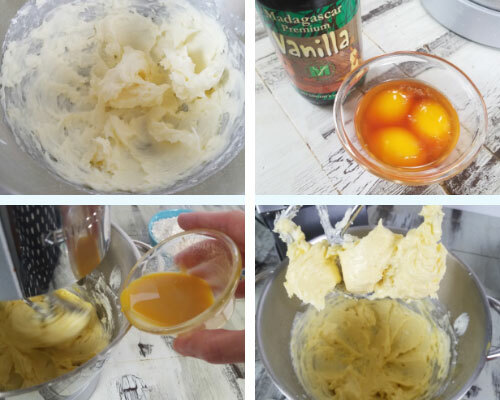 In a small dish whisk together egg yolks and vanilla bean paste. 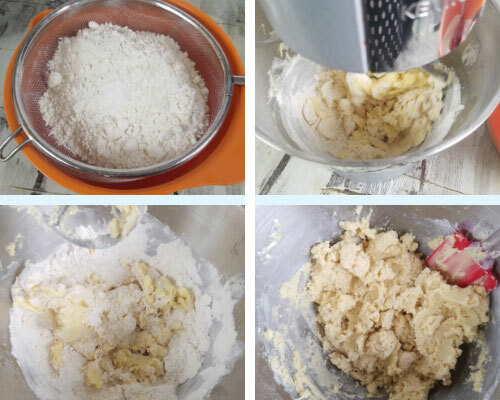 Gradually beat egg yolk mixture into the butter. 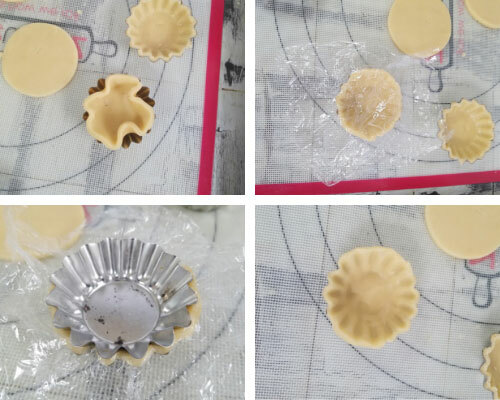 Place mini tart shell mold onto a baking sheet. Spray with a no-stick spray, set aside. Take out the chilled dough, cut it in half. Let if soften for 5 minutes. 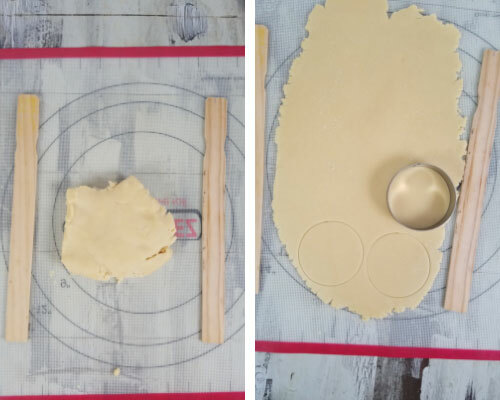 Roll it out between 2 sheets of parchment or use Dough EZ Mat. Roll it out using 1/8 inch rolling guides. Cut out as many rounds as you can. Gather scraps and re-roll. Shape the tarts. Using a fork to prick the bottom of the shells. Bake at 350F for 12-14 minutes until golden around the edges. 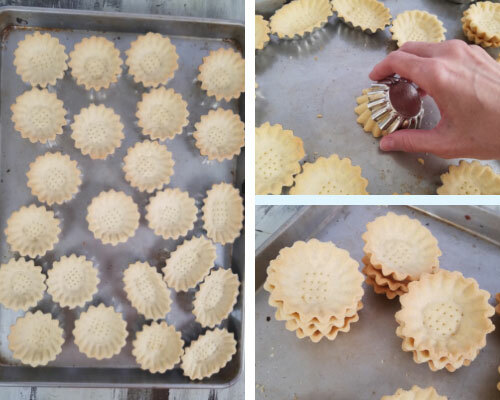 Let cool for 10-15 minutes before removing tarts from the molds. Turn the mold upside down and tap it firmly onto your work surface to release the shell. Let the tart cool before adding a filling. Can be stored in the fridge for up to a week or frozen for 3 months. Fill them with Pastry Cream or Whipped Cream and top them with fresh fruit. Than you Maisie. Let me know how it goes. Happy Easter.